All Saints' Day School will be on your right side. Parking is located directly to the right as you pull in. Please come down the main walkway to the front office to check in. From Highway 101, take the Monterey Penninsula exit in Salinas. Follow Sanborn Rd. for 0.8 miles and it will become E. Blanco Rd. 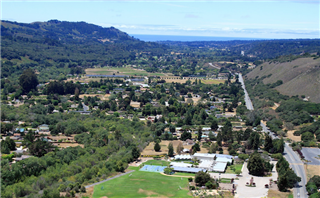 Take a left on Laureles Grade and follow it until the road intersects with Carmel Valley Rd. Take a right turn on Carmel Valley Rd. and travel for 5.2 miles. Click here for a map of the school's location.